Don’t assume this one cockroach is the only cockroach. It starts with one cockroach. Or two. 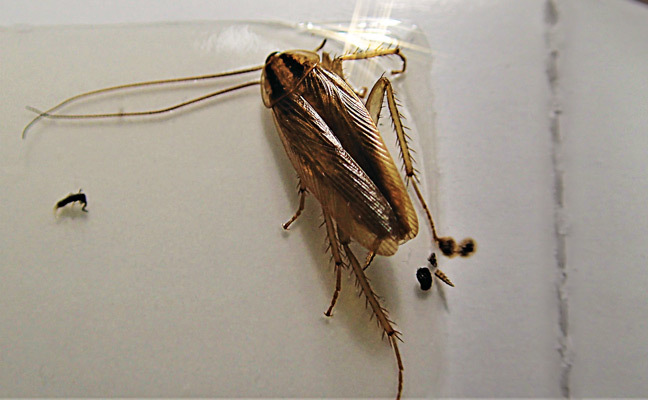 While it is possible that a single cockroach has been brought in one way or another, it’s more likely that there are more and this is just one of them. Cockroaches are quite good at not being seen. Take action: Make a thorough inspection — not just in the vicinity of the reported cockroach, but for all the primary harborages. Empty monitors are no guarantee, either; put out supplemental insect monitors and check them on your return trip. Mark your monitors with the date of deployment. Don’t rely on old bait do any heavy lifting. If there is old bait left from earlier infestations and now they have cockroaches again, it is a safe bet that the cockroaches have no interest in your leftovers. Take action: As you would with a new account, validate your bait — by offering it to the cockroaches and observing that they will, in fact, eat it — before committing several tubes to the effort. You should remove your bait after you have established cockroach-free conditions. And don’t apply new bait if there are no cockroaches to eat it. Don’t wait until next month for a follow-up. Just because you found only one or two doesn’t mean the crisis can be averted by one callback service. Take action: Follow up in one to three days to stay on top of your progress. If activity hasn’t ended, you should consider widening your search or digging deeper. Continue following up until there’s no activity for two visits. It ain’t over till it’s over. You can get caught on the rebound if you think you’re done before they think they’re done. Take action: After activity has ceased for two visits, follow up in a week. Then pay attention next month. Don’t wait until there’s a cockroach to point out conducive conditions. If you wait until things get bad to request cooperation, it just sounds like you’re making excuses. Take action: If there are accumulations of food debris or harborage that can be eliminated, point it out before you have a cockroach crisis.